Life Cycles and Our End-Of-Year Units: How Are They Connected? 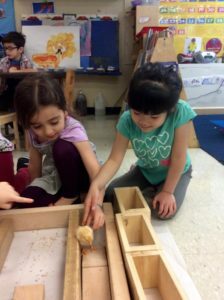 Interacting with a baby chick! Spring is an exciting season in play-based curriculum. Following thematic classroom units on the Earth, students at The International Preschools explore life cycles. Students of all ages are introduced to live caterpillars who are then placed in a “butterfly garden” and observed and recorded closely. 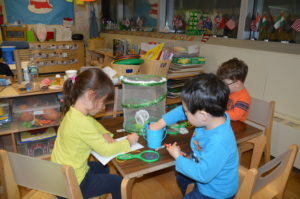 Preschoolers excitedly experience firsthand as caterpillars enter their chrysalises and emerge as butterflies! For a few joyful days, the children enjoy spending time with their new “classmates.” But soon, the teachers will tell the class that it is time to release the butterflies to live in their natural habitats. There is a bittersweet “ceremony,” where the butterfly gardens are opened and its inhabitants are set free, to live in a local park. Chicken eggs are introduced at each location in early May by Quiver Farms and are placed in an incubator until they hatch. All of the students (and teachers!) from the entire school spend time visiting and examining the eggs. Soon, the location is filled with delighted squeals of our preschoolers, as they have a front-row seat to the arrival of baby chicks! Under careful supervision, the students help to care for, and even pet, these tiny creatures for about a week. They are then transported back to Quiver Farms to live after a final goodbye and hug from the children. Earth Day is Every Day at The International Preschools! 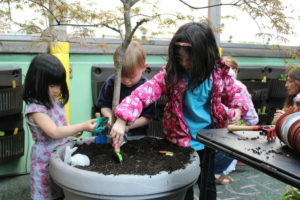 Children working on the 45th Street rooftop garden. At The International Preschools, every day is a day to take care of the Earth! During the month of April, the classroom themes center around Earth Day; sub-topics include ways to keep our Earth clean and safe for animals and people, including recycling and gardening. The goal is to teach the children small things that we can do to care for our Earth during April, that ultimately we can carry out year-round! 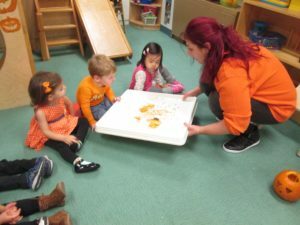 November is in full swing, and the oldest students at The International Preschools are learning about a wide variety of fall-related topics. This week, we will take a look at the fall themes inside the Pre-K (4 years old) and Junior K (4/5 years old) classes at The International Preschools. 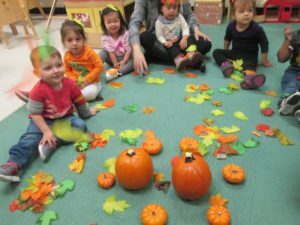 Children in 45 Creche (1.5s-2s) sat as a whole group to sing songs, using fall props such as pumpkins and leaves. At The International Preschools, play-based learning is used to help students acquire a love of learning. This week, we will take a look at how our youngest students in the Crèche (1.5-2-year olds) and Red Rooms (2-year olds) explore the season of fall via thematic units and play-based learning. 45th Street children learned about the inside and outside of a pumpkin by observing its seeds. They also learned a new vocabulary word – jack o’lantern – which is a pumpkin that has a face! Songs and books are an effective way to explore classroom themes and expose young children to new vocabulary. The classes at 76th Street used real pumpkins to act out the story of the “five little pumpkins.” Here, the children practiced counting with correspondence and provided another visual cue for storytelling. Some fall books that were read in the classrooms were Find a Pumpkin by Tad Hills, Five Little Pumpkins by Iris Von Rynback, Apples and Pumpkins by Anne Rockwell, and Clifford’s First Halloween by Norman Bridwell.